Geneology Random essays and observations. A few years back, the editor of the UK-based design magazine Eye asked me to write a short piece on space patch collecting for the "Common Knowledge" feature of the magazine. Until Ron Howard made a movie about the flight, Apollo 13 was a largely forgotten mission. Today it is moderately famous ("Failure is not an option"), but for this self-confessed space geek, it has always been memorable. Not only was it a disaster with a happy ending, but it was the flight when I discovered mission patches. With its three galloping horses hauling the sun chariot of Apollo, the drama and visual artistry of Lumen Winter's design immediately hooked me on collecting patches. After all these years, Apollo 13's is still my favorite, never equalled in the multitude of designs that followed. My collection tends to concentrate on the early, pioneering days of spaceflight: Gemini, Apollo, Skylab. (Mercury flights had no patches.) 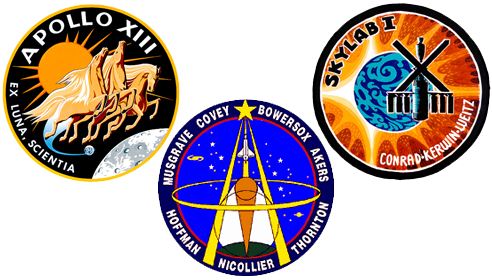 Amid the 100-plus patches designed for Shuttle flights, there are really only a handful that show truly inspired design. As an example, the design for the first flight to repair the ailing Hubble Space Telescope is largely abstract lines and curves, suggesting optics and rays of light, rather than depicting the telescope literally. But most are based on depictions of space hardware, with a liberal dose of stars-and-stripes for those patriotic quasi-military astronauts. You have to admit, there is very little drama that can be eked out of a design that features space hardware. Kelly Freas probably came closest with his lovely sunburst design for the 1973 Skylab 1 mission -- one of the few patches that is far more beautiful in its embroidered form than in the original design. In the world of spaceflight, predictability is everything, drama to be avoided at all costs. So I find irony in the fact that Apollo 13, the mission with the most dramatic patch design, ended up being the most dramatic mission in spaceflight history.